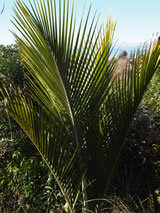 New Zealand's distinctive Nikau palm. 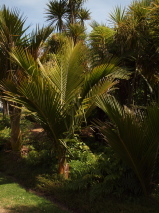 It has a leaf scarred trunk and a spreading crown of dark green fronds. These emerge erect and gracefully weep with age. At the base of the leaves the inflorescence is crowded with purplish lilac flowers, followed by bright red seeds. Nikaus need protection from frost and strong winds. 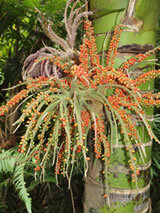 They do grow in most soils, however best in deep, moist, rich soil, otherwise can be slow growing. Great for coastal sites. We have this currently available in a Pot 8.5 & POT 4 & POT 2.5 containers. Ask for them at your retailer.